Naughty Dog: "We’re programming oxygen." 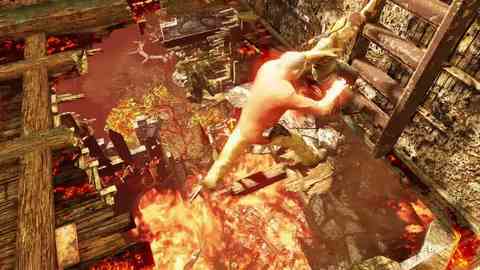 Having mastered ice, water and snow in previous Uncharted games, Naughty Dog has set its sights on groundbreaking fire effects in the forthcoming PlayStation 3 threequel. Speaking in an interview with the PlayStation Blog, Naughty Dog mouthpiece Arne Meyer explained that the game would feature realistic flames that slowly reduce the environment to ashes. "We're always on the lookout for new technical challenges and we're really happy with what we're achieving with our fire effects," he boasted. "It's not just a static asset – the fire deteriorates the wood realistically and there are blowback effects, like you would expect. The smoke is looking much better this time around." Referencing a level, trailered below, in which you have to escape a burning mansion, Meyer added that, in theory, you'll be able to stand still and watch the building burn down before your eyes. "You could sit down and watch the chateau burn around you, if you sit there long enough," he claimed. "However, we want the player to proceed through the game at a decent pace so that's not going to happen. Even in this demo, you can see beams deteriorating as they burn, and you can even take cover behind them when they give way and fall to the floor, only for that cover to disappear when the beam has burned away completely. "Procedural fire is a pretty difficult technical challenge, especially on top of everything else you're trying to get in the game, but it produces some brilliant effects, like the corners of the wallpaper starting to roll and then igniting, and then the embers flickering in the air. "Essentially, we're programming oxygen and then having the fire follow it around the environment," he explained. Uncharted 3: Drake's Deception, the too-hot-to-handle follow-up to awesome 2009 adventure, Uncharted 2: Among Thieves, will be out on 4th November.